I came across this copy of a ship manifest the other day. I’ve had it for awhile but never really digested it. It’s the ship manifest for the SS Chiyo Maru, a ship that traveled between Hawaii and Japan. 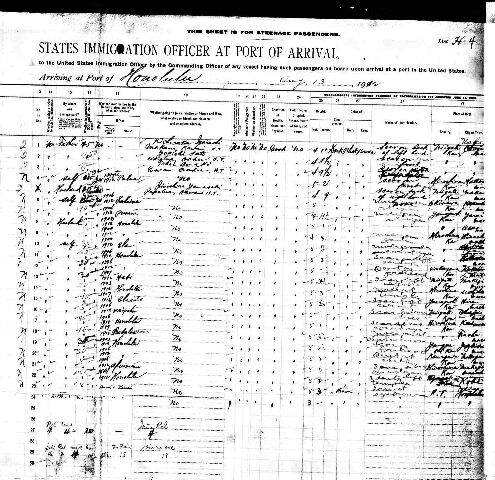 My Grandfather’s cousin, Louisa (Pacheco) Iida, was on the ship with her husband, Joseph Shintaro Iida, and their 4 year old son, Benedict Iida. This manifest is for the port at Yokohama, Japan. It was returning to Honolulu, Hawaii. They left Yokohama on the 4th of August 1912 and arrived in Honolulu on the 13th. I had several questions when I really analyzed this document. It expands my knowledge of the Iida’s but makes me wonder about a few things. I knew that there was travel between Hawaii and California. I found several manifests with cousins going back and forth. I had no clue that any of my Grandparent’s cousins who married into Asian families had made trips back to their spouse’s homeland. I have known for some time that Asians were more likely than the Portuguese to return home (distance and cost being huge factors). Since Joseph Iida came to Hawaii with his parents, I didn’t really think about the fact that he might have relatives back home to visit with. You have probably caught on to the fact that this was an interracial marriage…in 1912. While completely acceptable in Hawaii, interracial couples were not tolerated in the rest of the US. In fact, it was illegal. I wonder how Louisa and Joseph were received in Japan? Were Japanese/Caucasian couples a rarity? Was it less unusual because they came from Hawaii? This brings me to another issue–travel. I have read in different sources that Asians were separated from Caucasian passengers. 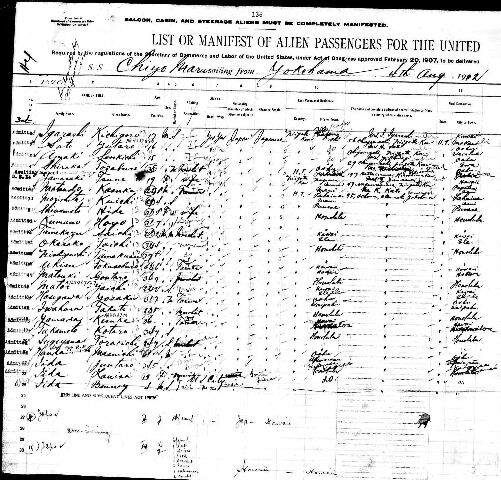 I believe that Asians had to travel steerage no matter their financial standing. How did Louisa and Joseph travel? Joseph was a bookkeeper for the Kilauea Sugar Plantation on Kauai. Even though wages were paid by race, I have to assume that his pay was much better than the field laborers. So, he might have been able to afford better travel accommodations for his family. Then again, this was a ship going to Japan with Japanese passengers, so maybe race wasn’t an issue. It does make me wonder about Louisa. Looking down the list of passengers it appears that she was the only Caucasian, though names can be deceiving! Was she allowed to travel with her husband? Did any complications arise because of their different races. I sure would like to know what it was like for them! I know that when these interracial couples moved to California in the 20s and 30s they came to mixed reactions even from their own cousins. It could not have been easy to leave the comfort of Hawaii for places in the world where they would be looked down upon. Another aspect of Louisa and Joseph’s story to ponder.